Strawberry Pie - Super delicious! 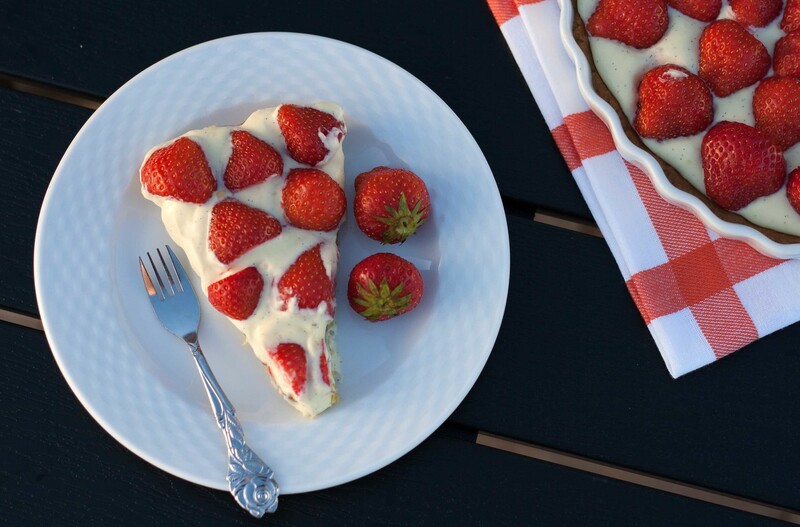 For us summer time is equal strawberry time. 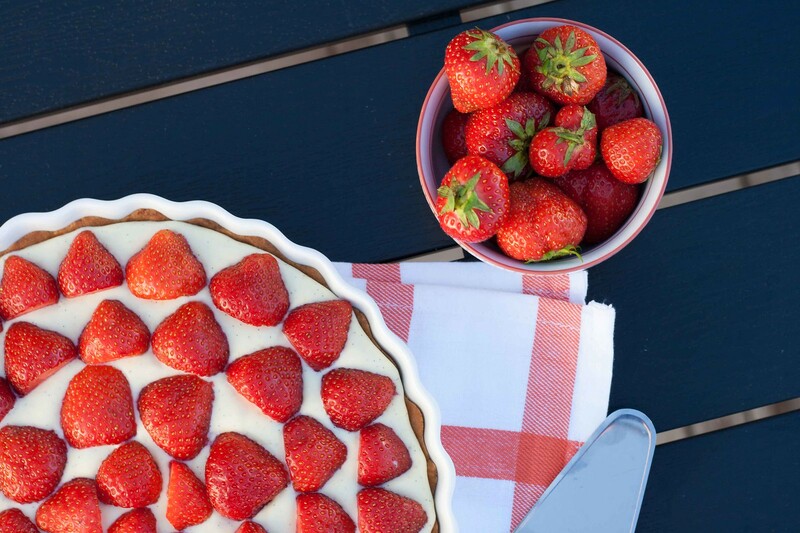 We have no idea how many strawberries we eat during the summer season but it is a lot! In the peak season, where the strawberries are cheapest due to the large quantity of ripe berries, we literately eat them for dessert every evening. Most of the time we simply cut the berries in smaller pieces and eat them as topping for the famous Danish food tradition ‘Koldskål‘. Koldskål, directly translated means ‘Cold bowl’ and is basically chilled butter- and soured milk mixed together with some eggs, lemon juice and vanilla. It is mostly eaten during the hot summer period because of its fresh- and lightness. 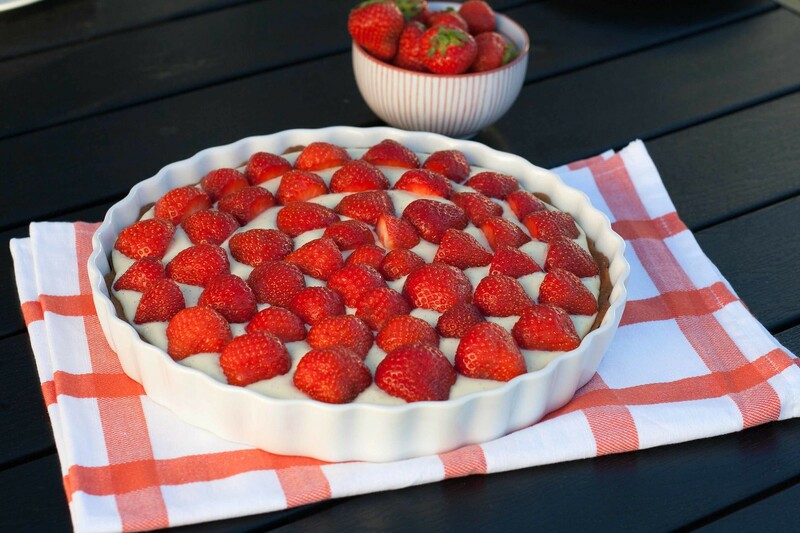 However, when we really want to treat our self, or our guests, we make this strawberry pie. It is just super delicious and relatively easy to make. 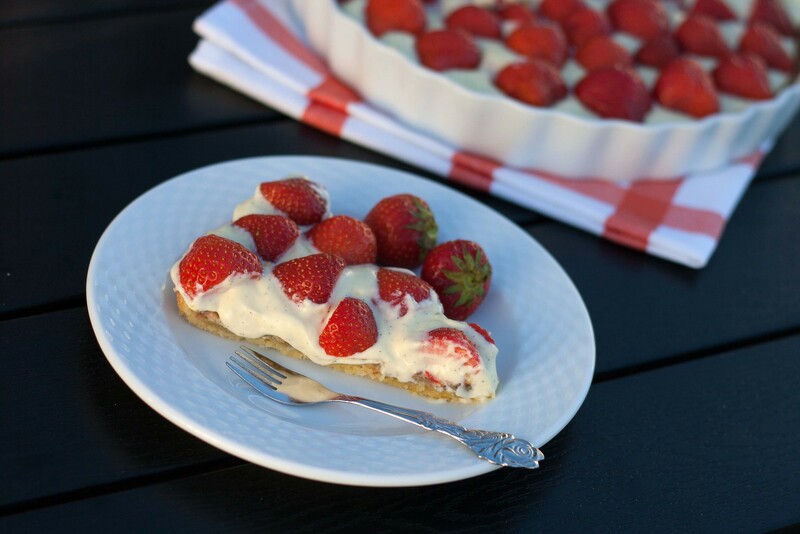 The pie consist of a crisp pie crust, a thin layer of almonds/hazelnut cream, a layer of vanilla-cream and finally topped with fresh strawberries – this is definitely one of our top 5 dessert recipes. We usually make the pie with strawberries but you can easily use this recipe as base for any berry-pie like blackberry, raspberry or maybe blueberry. Step 1: Mix all the ingredients together in a large bowl and knead until you have a smooth dough. The butter much not be melted or soften, use it direct from the fridge. You can speed of the process of kneading if you cut out the butter in small pieces. Step 2: Divide the pie dough in two equal sized pieces. Roll out the dough and place it in ovenproof pie dishes. Refrigerate the pies while you prepare the nut cream. Step 3: Soften the butter and mix it with the sugar. Add the rest of the ingredients and mix well. 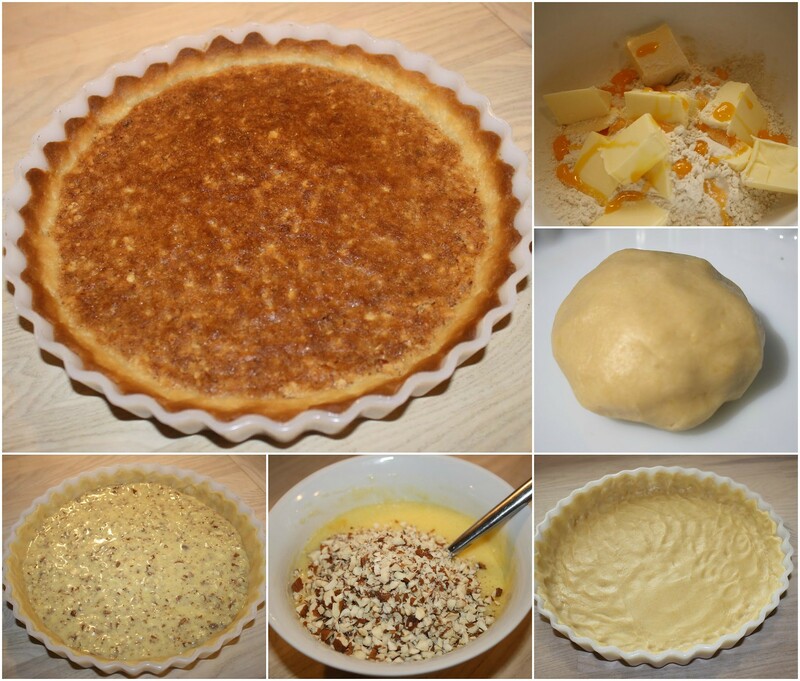 Step 4: Pour the nut cream into the two pies and use a knife to spread it out in an even layer. Step 5: Preheat the oven to 200 C (400 F). Bake the pies one by one on the center position in the oven for about 20 minutes. Step 6: Mix all the ingredients (including the empty vanilla bean) in a saucepan and whisk/stir well. Step 7: Heat up the mixture to boiling point while you are whisking constantly. Keep heating until it has a proper thickness. Step 8: Remove the vanilla bean and pour the hot vanilla cream in bowl and let it cool off. Step 9: Whip the heavy cream to a whipped cream. Step 10: When the vanilla cream is cooled off gently mix it with the whipped cream. Now you have the most delicious vanilla-cream for your pies. 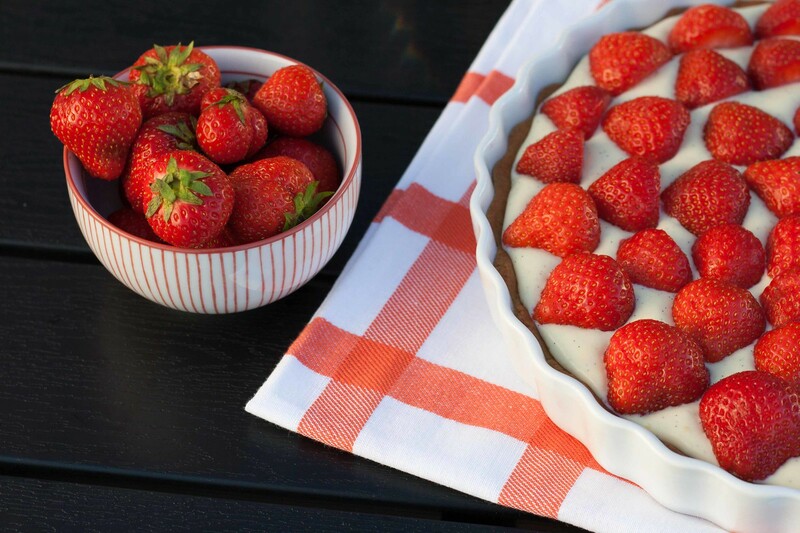 Step 11: Pour the vanilla-cream into the two pies and decorate with strawberries. 1: You can easily skip a couple of the steps in this recipe by buying the pie crusts and the vanilla cream premade. 2: The baked pie crusts, with the nut cream, can be frozen and used on a later point. 3: Spread out 50 g (2 oz) of melted chocolate on top of the nut cream on each pie. 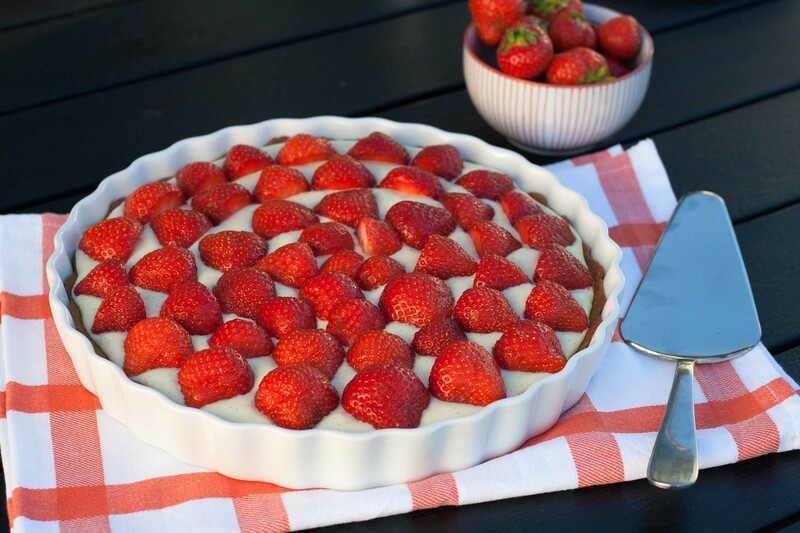 When it is hardened pour the vanilla-cream on top and decorate with strawberries. The chocolate gives an extra great taste to the pies. 4: Try to swap out the strawberries with different fruit (like blackberry, raspberry and blueberry).